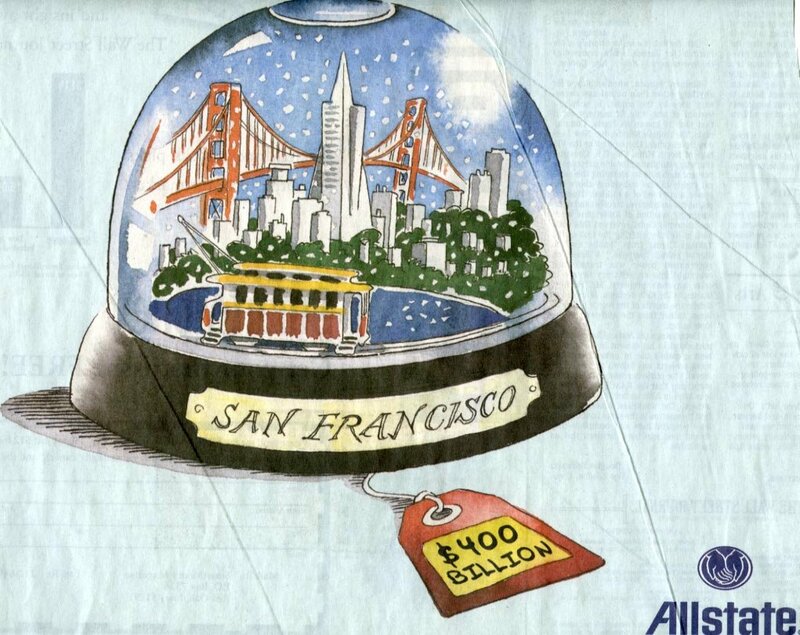 Copyranter points out an Alstate ad that appeared in tuesday's Wall Street Journal that showed a snow globe version of San Fransico with a $400 billion price tag attached to it. Apparently, while that seems low, that's the price to rebuild San Francisco after an earthquake of 1906 proportions. The headline reads, "If San Francisco had the same size quake as in 1906, it could cost $400 billion to rebuild." Whille Allstate may want San Francisco residents to feel as though they are in good hands, that's not exactly the most comforting method to do so. Although it certainly gets one thinking about just how much insurance one should have when living on a fault line. We've all been interviewed by brainless buffoons. We've all had to divulge hidden secrets during interviews. We've never, though, watched such a great combination of the two in the name of promoting Microsoft's Office Certification program. This, courtesy of the agency with the wacky name: Wexley School for Girls. Shot atop a 54 story building in downtown Sao Paulo, Brazil, Dieste Harmel & Partners has created a CGI-filled spot for Gatorade that has a football team doing its thing while the voiceover intones, "When you give everything to win, you give life to the field." And, indeed, life is given. View the spot here. OK. We're not going to say the C word or the P word or the R word. We're going to say the H word. Homage. Yes. With these two new spots for the new VW Jetta, Crispin Porter + Bogusky is paying homage, as pointed out by Advertising/Design Goodness, to Insurance Corporation of British Columbia's Counter Attack don't drink and drive ads. Instead of the doom and gloom of drunk driving, CP + B is focusing on the Jetta's safety features and how they can protect you in similar situations. Of course, this doesn't mean everyone can now drink and drive nor feel safe from drunk drivers. We like. A lot. In its continuing effort to make B to B high tech advertising less boring, Hanft Raboy & Partners has created another very un-high tech advertising-like promotion for its client Fortify Software. They've created a game called IT Defender during which the player (the guy in charge of network security) has to Pac-man his way around the office long enough to make it until 5PM before the boss catches him and drags him into a time-wasting meeting that causes various security breaches to occur. As one whose done a ton of high tech advertising, we can easily say, this rises above most. Duval Guillaume has created a new set of commercials in Scandinavia for Schweppes which sophistication and politeness to new levels. One one commercial, a bar fight becomes a gentlemanly exchange and a football team become wise beyond their stereotype. The campaign, which will run in Sweden, Norway, Denmark and Switzerland, works to position the new Schweppes Fruit Flavors as a grown up fruit drink. You can see two of the spot here and here. As Adverblog ever so appropriately says, "To promote milk you can either say it's healthy and good for your bones, or you can go viral." Friesche Vlag creamers chose to go viral and you can just imagine where it ended up. Launched in late March by Starwood Hotels, TheLobby promises "to help keep Starwood Preferred Guests on top of the latest travel trends." The blog offers general travel information as well as programs available at it collection of hotels including the Westin, Sheraton, St. Regis and W. The Wall Street Journal analyzes the whole thing but we'll sum it up. It's a blog. Great. They don't accept comments. Bad.